For a long time if you needed a new cooler for your CPU, you had to get one that used a heat sink and a fan made specifically for your AMD or Intel processor. Today there are all sorts of options that don’t need fans that can be used on both AMD and Intel CPUs making shopping simple. 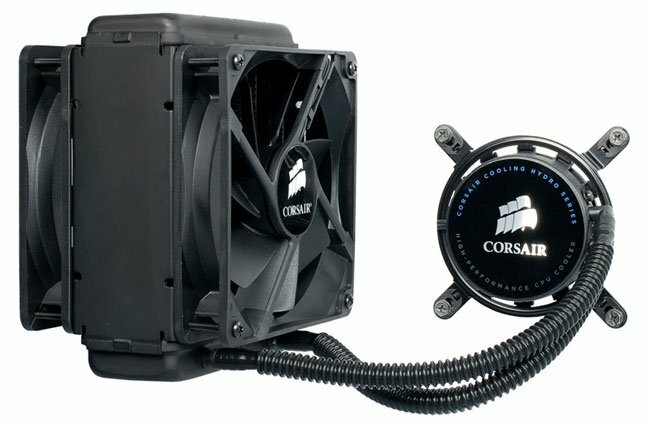 Corsair has unveiled a new self-contained liquid cooling system for the CPU called the Hydro Series H70. The CPU cooler is made to work with both AMD and Intel CPUs. The device is all self contained and pre-filled so all the buyer needs to do is install it. The H70 has a double thickness 50mm radiator and has a pair of 120mm fans that have user selectable speed in a push pull configuration. The cooler also has a redesigned heat plate that promises more efficiency that older Hydro series coolers like the H50. Pricing is unknown at this time.